Circling like vultures, ever ready to pick at the bones of their fallen victims, the dogs of the Islamic State gather for yet another massacre. Their mouths foam with the disease that has infected the countless generations of hedonistic barbarians that came before them. This plague manifested itself with the colonialists that once spilled blood in these same fields. This disease is the same illness that once sent Europe into the dark days of the 1940s. It is the same hunger that drove on the Khmer Rouge as they turned rice patties into the killing fields. ISIS is the manifestation of the disease that has doggedly nipped at the heels of humanity for all of our existence. Its the disease that now threatens to put the final nails in Iraq's coffin. Blood still drips from the veins of the crucified, the beheaded, and from the lifeless bodies of those left in ditches after mass executions. The mantra for this new caliphate is written in their blood, the ink of the barbarians that exploited their deaths, a medium that speaks to the indifference of the onlooking world. It is in their deaths that the foundations of Isis's terror has been laid. With every fallen victim comes a new mountain of propaganda in this depraved push for religious dominance. It is a sacrifice, a burnt offering to Isis's own insanity, that feeds the wicked intentions of Islam's radical fringe factions. Tonight the Yazidi people are the scapegoats that are to be offered up so as to feed the lust of those who claim to fight for All-h. Their women and girls are to be used for sexual deviancy. Their men and boys to be drained of their blood as their bodies return to the sun scorched soil. Their voices to be forgotten as they, in their darkest hours, offers up one final scream in hopes that a deaf world might finally hear. No community has ever faced genocide with the timidness of a lamb. Once the butcher's knife makes it's first appearance the would be victims always find ways to defy the fate they've been slated. Their voices become raised. The muscles become rigid and the heels dig in for the fight ahead. It is not in the nature of man to take that last breath in peace. There has never been a victim of genocide ready to die for the sinful lust of another. The Yazidi are no exception to this rule. When ISIS came to Sinjar the Yazidi community already knew what was awaiting them. Due to their religious beliefs the Islamist radicals had already plotted to kill the "devil worshipers" in mass. The black flag that ISIS uses was an unadulterated symbol of their intentions toward the Yazidi minority. No quarter would be given, no mercy would be shown, and no peace could ever be obtained from the clutched fists of the barbarians that comprise Isis's forces. But what makes the Yazidi such a vulnerable target in Isis's genocide of "non-believers"? Much like Muslims, Jews, and Christians; the Yazidi are monotheists. They believe in one god who created all life here on earth. Yet the connection with Islam almost ends at that point alone. For it is in the Yazidi religion, Yazdanism, that the belief in one god diverges into other beliefs that Islam does not share. It's these differences that place Islamic fundamentalists at odds with the "pagan" beliefs of the Yazidi. In Yazdanism the creator god entrusted the world to a Heptad of Seven Holy Beings who were to care for all of creation. These "angels", or heft sirr (the Seven Mysteries), are all to "bow to Adam (man)". Yet the head of the heft sirr, or archangels, does not bow to mankind. Instead, Tawûsê Melek, who was said to be created from the creator god's own illumination, refuses to bow to mankind. This makes Tawûsê Melek a special part of Yazdanism and is revered by the Yazidi faith. Islam and Christianity have long equated the worship of these "angels" as demon worship. And it is in the worship of Tawûsê Melek that the Abrahamic faiths have created their worst offense to Yazdanism. For it is in the story of Tawûsê Melek that fundamentalists (Muslims and Christians alike) have concocted the belief that this lead angel is their demon Shaitan (Satan). Yet it is in the story of Tawûsê Melek that it becomes most evident that Yazdanism is a distinct and separate religion from Islam, Christianity, and Judaism. For it is in his story that Yazdanism's many other influences becomes more evident (including Gnosticism, Zoroastrianism, and several eastern religions). However, due to the complexity of any given faith, we will not delve too deeply into the story itself but rather look at how it has been exploited to target the Yazidi minority. Westerners have long romanticized the Yazidi in as much the same way as they have with any other Eastern religious minority. Their faith is not explained in Western media when it so callously equates it to Islam. The religious practices aren't valued for their unique contributions to world community but are rather slighted by upholding old myths of devil worship. Their culture as a whole isn't recognized for it's depth and beauty but rather is looked at with a passing glance. The Muslim world has long targeted the Yazidi community with pogroms and social injustices of all sorts. Imams and religious leaders within Islam have accused the Yazidi of serving Shaitan (Satan) due to their incredible lack of understanding when talking about Yazdanism. The methods of worship and prayer that are hallmarks of Yazdanism are considered pagan by Islamic fundamentalists. Throughout the centuries the Yazidi have been rounded up and killed in smaller versions of their current holocaust. Their children are targeted with forced conversions to Islam. Their women used as sexual objects, so easily discarded after they've outlived their purpose. And the Yazidi men have often been massacred by Arab neighbors. All of this because the fundamentalists could not look beyond the strangling hold their own faith places upon the overall conscience of an already ethnocentric society. Both East and West have failed to recognize the value of a richly diverse society, a society to which the Yazidi culture and beliefs could so greatly contribute. While not all Muslims demonize the Yazidi and their beliefs, and not all Westerners dehumanize them by marginalizing their culture, the damage inflicted by those who do is already visible. In a community, like that found in Iraq's northern regions, the lack of tolerance for differing beliefs and practices is intolerable. It permits a situation in which only the largest faiths and ethnic groups are capable of surviving while minorities are forced to struggle to eek out an existence. Now the Yazidi prepare to fight back. Now they have no other option but to stand up and defiantly look death in the eye. All because the world, as a whole, has long ignored their screams for help. The Yazidi believe that all evil in this world arises not from a "great Satan" or demonic presence of any form. It is in their religion that the true nature of evil is best explained. For it is in the Yazidi faith that evil is said to be the product of man's heart, and man's heart alone. The Islamic State is proving this to be true. The apathy of the world community is proving this to be the only source of evil in this dark and dreary world. When Saddam tried to exterminate the Yazidi the world generalized their plight by bunching them in with the Kurdish population of Iraq. When pogroms have occurred and the Yazidi were targeted by their Arab neighbors the colonial powers wrote it off as a "ancient rivalry" of sorts. 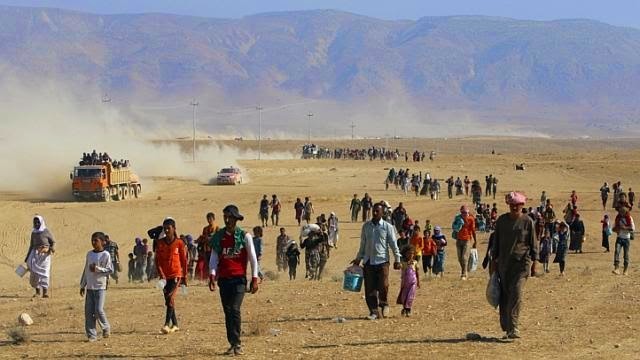 Just as with the Roma in the Porajamos, the world denied the magnitude of Saddam's crimes by denying the targeting of the Yazidi for their faith and ethnicity. Just as with the Bosnian Genocide, the world devalued the lives of the Yazidi by cheapening their plight with excuses for the aggression of the Arabs. In every genocide the Yazidi have faced there has always been an apathetic world ready to look the other way. In every struggle to survive the Yazidi have found themselves begging for help from an increasingly deaf world. Today we watch as the most powerful nation on the planet offers only tokens of support for their plight as it refuses to commit to the promise of "never again". Cheap air strikes are all the world's most technologically advanced military will give as it's governing body refuses to do all it can to stop the genocide of the Yazidi. So as the dead and soon to be dead drift from this earth we monitor their demise with drones overhead. And as the children of the Yazidi face slavery and sexual abuse at the hands of ISIS heathens we bomb random artillery pieces and abandoned checkpoints. This is the extent of morality in our modern age. We promise the same intervention the allies inadvertently offered the Jews, and yet when the time to commit arises... we are impotent, so to speak. It was once said, and often repeated, that the only thing that evil needs to succeed is the silence of good men. The Yazidi believe that evil arises from the hearts of all mankind. But they also believe that the good in this world also is a product of the human heart. Thus a war, of sorts, can be depicted as raging within the human spirit. A desire to create, a desire to save, and a desire to protect are all found within the heart of man. Yet the desire to destroy, to devour, and to prey upon others can also be found within the same heart; at times, simultaneously. The salvation of modern man is the ability of mankind to overcome the evil we so often create. If mankind is truly "good" inside, if there is a hope for a better world still yet to come, then there is a way to conquer the evil tendencies of man. The first, and far from the least of which, is the apathy that so often paralyzes us in this struggle. If communities like that of the Yazidi people are to survive in this ever shrinking world then we must surrender ourselves to empathy rather than apathy. We must adhere their afflictions to our own sense of survival and thus make their struggle our own. By denying the value of their culture, by giving into the notion that someone else will "save" them... we lose something of ourselves. In remaining silent we hand over the sword to their executioner. By no lifting a finger to stop their demise we join the ranks of the barbarians that slaughter them. A world that believes in equality, tolerance, understanding, and the value of diversity can not bare the blight of groups like ISIS. No matter what your religion is, no matter where in the world you are, the struggle to stop the spread of genocide and hate is one that you can not turn away from. Either you are willing to fight against racism, religious violence, ethnic hatred, and bigotry or you are a contributor to it. You don't get to remain silent. Many of you won't have the option to get out there and do the physical work required to stop genocide. There probably won't be rallies and protests in support of the Yazidis. And when it comes to the political legwork many of us are intimidated by the actions required to just get the ear of our government long enough to scream for the Yazidis. But there is still the work of raising awareness. And this is a job that all of us should be doing without hesitation. It is a job that each of use are supposed to be doing for all victims of genocide, regardless of who they are and/or who the murderers are. In the notes below you will find countless links that are easily shared on twitter, facebook, tumblr, pintrest, and all other social media sites. These articles should be read and used in conversations so that you can help bring awareness of the Yazidis' plight. But they are just a start. You should, and will need to, continue to read more about the Yazidi people and the genocides they have endured. The more familiar you become with the people and their struggle the more convincingly you can share their story. In addition to being an online presence for the Yazidi community, you should also be sharing their story in your daily life as well. Each of us have countless conversations daily. Chances are you will spend some time today talking about anything and nothing at all with people from many different walks of life. These are all opportunities to raise awareness. With some tact and patience, you can usually grab the attention of at least one person who is willing to listen. And that one person is a chance to keep the information flowing. That one person is a chance to stir the heart of your fellow man and create the opportunity for positive change... to touch the "good" within their heart. So while you are talking about Gaza, Sudan, North Korea, or the Rohingya... don't forget the Yazidi. While you are talking about television shows, music, politics, sports, or simply making small talk... don't forget the Yazidi. If and when the opportunity arises... scream for them. Argentina's Version of "Manifest Destiny"